If you haven't seen the new Inspired by Stamping stamps yet, head on over to the site and check them out! 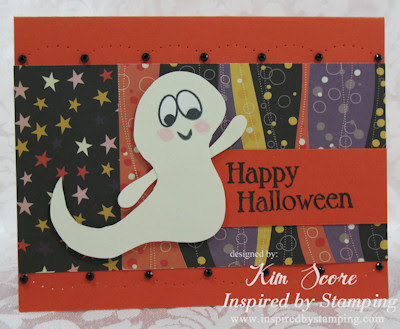 For my project, I used the cute face stamps from the Pumpkin Faces set to create this little ghosty. I hand cut him out of a piece of vanilla cardstock. Sorry, I don't have a pattern but it's pretty easy to freehand it. The greeting is from the Halloween Labels set. Awe, so cute! Fun papers and that ghost is adorable!